I wonder how the one on the right was use, two people holding it, or have we finally found evidence giants existed. I know someone who has studied the lower palaeolithic of Africa and her thoeory on giant hand axes was that they were status symbols and somehow linked to male "potency", objects to show off rather than to use in any practical sence. Naw...It's the 'my axe is bigger than your axe' syndrome. as Mr.hertzian cone said, status symbol only. mr.hertzian cone wrote: I know someone who has studied the lower palaeolithic of Africa and her thoeory on giant hand axes was that they were status symbols and somehow linked to male "potency", objects to show off rather than to use in any practical sence. Why am I not surprised this theory came from a woman? 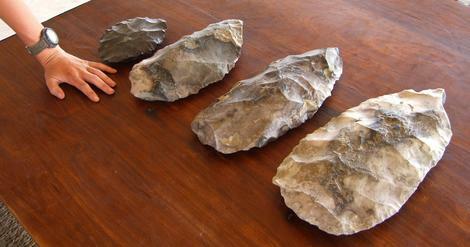 In think it's evidence for a prehistoric tribe of hand axe wielding Hagreds... he he!